We started the day off skinning deer heads; the two which belonged to the other student in fact. We put the capes in the back room, salted them, and left them in a pile with the other skins to be sent to the tannery. 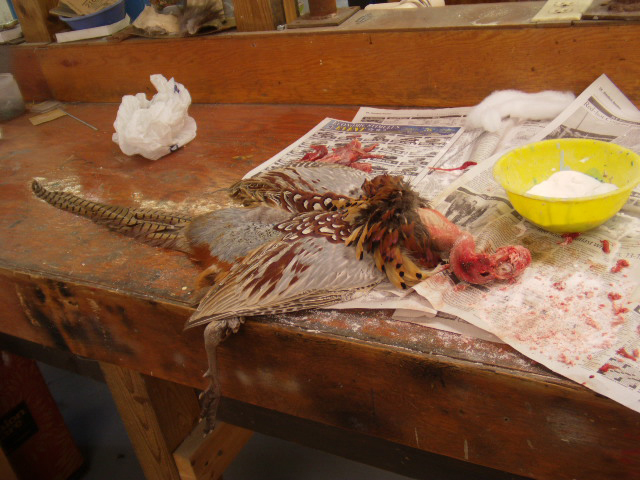 We then began working on our own pheasants. Mr. B gasses the pheasants so the skin and feathers remain flawless, but it renders the meat inedible. I'm dealing with the guilt of knowing this animal died just so I could make art out of it, and nothing more. My morals are somewhat compromised but it's a sacrifice I'm willing to make for this education. As I scrape meat off the bird skull with my fingernails, the smell of Dead permeates my nose and I force myself to like it. I've never been too intimate with my meat, and in the past I've only used scalpels to cut specimen-never my bare hands. I try to drink coffee while I work in a bizarre attempt to condition my stomach. We learned today that when a skin isn't fleshed out and salted quickly enough the rot takes over and it really starts to stink. These capes are called "spooks" and will taint the other skins. Mr. B calls me "girl" when he comes by to check on my progress, always with a smile. I think he has a soft spot for young women, particularly those who are easy on the eyes, so I embrace it. I'll even be so bold as to say I might remind him just a bit of his granddaughter, whom is the apple of his eye. He's also generous with the positive feedback which, in a scholastic setting, I am not accustomed to. I rigged up my hoop in the barn when I got home, so I can practice aerials during the week. Plus, I'm nowhere near a gym and the terrain isn't ideal for running outdoors, so this will basically be my sole source ofexcercise. Unfortunately by the time I figured out what beam to use as a rigging point, and how to get up there, then actually hung it, it was too dark to use. I went inside and did some yoga in front of a fire insteadwhile I watched "Donkey Skin" on DVD. It's the only movie I brought up with me, and it has inspired me to only speak seulement en francais while I'm alone in the cabin with the cats.